Hair Update: 2 months NATURAL!! Now at the end of this video, I figured he was joking with the wording on the box. But, really?? Why would a person with already straight hair want to use a relaxer?? I don't get it. What people who are not familiar with relaxers should do is research the products. Unfortunately for black people, relaxers is something that we've been programmed thinking that we NEED. When in fact our hair is perfectly fine. So, in a recent trip out of town for my family reunion, one of my cousins made a comment. 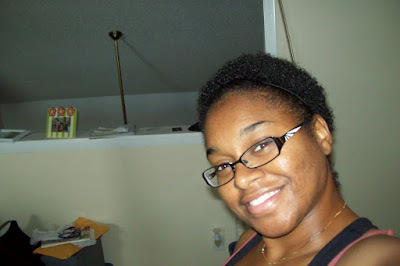 "No, I'm just wearing my natural hair"
Then another conversation with another cousin was crazy! "You need to do something with your hair...a comb, or something...you need to get it done!" So, at this point, I was irritated to say the least. "Are you questioning God's plan? Do you have a problem with God's creation?? Because this is what he created. Are you saying he's wrong? If so, you may need to go to church on Sunday to discuss that with him"
O.k. I may have been a lil harsh...he is my cousin after all. But, I was tired of having to justify my hair to family. Why did you cut it? What made you do that? etc. I was a lot annoyed with it. But, I really tried to take it in stride.